P&O Cruises | Frequently Asked Questions | On Shore - How do I know if a shore excursion is right for me? You are here: Home > Advice centre > Shore Excursions > How do I know if a shore excursion is right for me? Q. How do I know if a shore excursion is right for me? By logging onto Cruise Personaliser you can narrow your search by choosing categories that appeal to you. 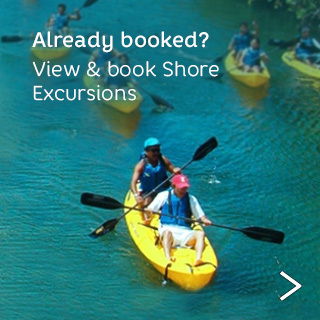 You are also able to search by shore excursion duration or activity level. What do I do if a Shore Excursion is sold out ? What will happen to my shore excursions if my cabin changes?